Bearaphanalia Bears ® came into existence in 1987 quite by accident! Jutta was always very creative. Busy as a legal secretary, she also taught ceramics in her spare time, achieving her Certified Ceramic Teacher Certificate. After 12 years of teaching, she had to give it up due to health reasons. This left a very large creative gap in her life. One day while visiting a porcelain doll shop, she noticed a doll holding a teddy. When asked if she could purchase just the teddy, the store owner told her he was not for sale as a friend of hers had made it for her. A light bulb came on instantly for Jutta. Up until then she had always thought that bears were made by "large" manufacturers - not by actual people. Always one to jump in with both feet, she set about finding supplies to make her own bear. This was no easy task! Living in Canada, where bear making was still in it's infancy, there was very little in the way of supplies. She had to settle for various horrid synthetics from fabric stores and mass produced patterns put out by clothing manufacturers. After making several bears (she thinks they resemble large rats and her mother still has a collection of these early "Bearaphanalia" bears which Jutta wishes she would get rid of!) and not being satisfied with any of them - Jutta decided to design her own pattern. She keeps saying that you have to design a lot of frogs before you find that prince but with perseverance you succeed - and in 1987 "Gator" was born! "Gator" is the flagship bear of "Bearaphanalia" and still is the most popular bear in the line. Truly the first bear with ATTITUDE, he has a way of stealing your heart and even men are attracted to his rugged good looks and cheeky manner. Jutta travels to many conventions in the US throughout the year as well as the Bear Fair convention in her hometown of Calgary each October. 1994 was a banner year for Jutta. In October of that year she had her bear, "Basil", featured on the cover of the prestigious Teddy Bear Review magazine. In November of that year she was invited to attend the Walt Disney World Teddy Bear and Doll Convention (c) in Orlando, Florida. The first Canadian artist to be invited to this Invitation Only event! A very cherished memory for Jutta. Other Achievements 1992 May/June - Teddy Bear Review magazine July/Aug - Victorian Harvester magazine Sept/Oct - Victorian Harvester magazine December - Local Cable TV show 1993 Jan/Feb - Teddy Bear Review magazine February - Insight on Collectibles magazine Mar/Apr - Toy Box magazine article April - Rocky Mountain Art Gallery personal appearance July - Great International Teddy Bear Connection Video featuring "Croc" and "Gator" Aug - Victorian Harvester magazine article 1994 May/June - Teddy Bear & Friends magazine "Tribute to Tiny Teddies" featuring "Christopher" April - Dolls, Bears & Funny Hares personal appearance and signing April - Rocky Mountain Art Gallery personal appearance May - Television appearance on local TV show July - Edmonton Journal newspaper article July - Calgary Herald newspaper article Aug - Alberta Report magazine Sept/Oct - Teddy Bear Review magazine COVER and feature article Nov - Walt Disney World Teddy Bear & Doll Convention (c) Invitational 1995 Mar/Apr - Teddies Own Journal magazine April - CBC Radio interview & fund raising auction for Hospice Nov - Channel 2 & 7 Breakfast show filmed at Bearaphanalia with Chester Freeman Nov - CBC National News interview Nov - Calgary Herald newspaper article Nov - Teddy Bear Sourcebook 1996 Gallery of Teddy Bears book - the first book on Canadian Teddy Bear artists 1997 February - Designed ceramic tiles for Panache Studios featuring "Gator" March - Teddy Bear Scene (England) magazine article Sept - How To Make Enchanting Miniatures book by Deb Kesling Oct - Co-authored and published Fuzzy Wuzzy Teddy Bears book 1998 Feb - Teddy Bear & Friends magazine article on teddy bear artwork, featuring pastel chalk drawing of "Friday" Feb - Collector's Mart magazine article on Bearaphanalia by Beverly Mattheson Port 1999 Participation in HAH '99 (Hike Against Hate) For more information on this wonderful organization, and for full details on the hike click here www.ihave.org Dec - Teddy Bear & Friends magazine special theme issue featuring "Charlie". Dec - Special Ltd. Ed. bear for the Teddy Bear Museum in Naples, Fl. to celebrate their 10 year anniversary. 2000 July - Canadian Teddy Bear News magazine feature on Pioneer Artists. August - designed bear for Teddy Bear Times magazine (”Kiefer” - Ltd. Ed. of 10) for their 10th Anniversary issue give away. August - donated one of a kind, Olde Worlde Santa, to Berenbos Sanctuary for Internet auction. October - Teddy Today (US) magazine four page feature article. 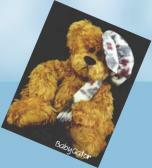 October - Teddy Bear Times (England) magazine article featuring mohair Westie. October - Teddy Bear Scene (England) magazine showing Olde Worlde Santa donated to Internet auction to raise funds for Berenbos, a real bear wildlife sanctuary. November - Teddy Bear Club International (England) selected a bear to be featured on their website (http://www.planet-teddybear.com) as one of 12 artist bears featured to design and send virtual postcards.